Movies based on books are often hit or miss, and British films sometimes fail to be more than the sum of their parts, no matter the cast, crew or script. A Street Cat Named Bob isn’t the biggest film to hit the cinemas in recent months, nor was it given much attention aside from the odd advert I spied while watching The Chase on a lazy weekend. I remember talking about the book when my fiancee and I saw the ad, and she was enough of a fan to tell me the story, and that it was based on real events. “Yeah, like Schindler’s List?” I replied, thinking I was clever and funny. (I was neither). But it turns out there is an element of truth to the tale in a Street Cat Named Bob. 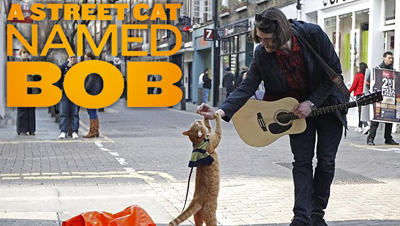 Luke Treadaway stars as James Bowen, starting out as an unsuccessful busker on the streets of London. As a recovering heroin addict, he's at a low point in life, and meets a feline friend that helps him to sort himself out by learning to care for others. You don’t have to be an animal lover to understand how important animals can be for therapy, while it shines a light on the difficulties that come with addiction, as well as the struggles in terms of the recovery process while homeless. Many books have had their original meaning torn away in a bid to make the story more transferrable on the silver screen, but Bob is reasonably true to the source material. (According to my partner at least.) They went for an actor that vaguely looks like Bowen, while the cat plays himself. Bob’s not a bad actor, putting a few of us meatbags to shame with a performance that does well in terms of showing what life was like for his owner. As one of the many inhabitants of London, it’s clear that homelessness and drug abuse are reasonably rife, and it’s unlikely that everyone will be lucky enough to have a stray cat walk into their life. As a celebration of the story it’s a great film, showing the animal the attention it deserves after indirectly saving his human. If it wasn't based on reality, there'd still be a decent message to draw out, but as it is, it’s one that should leave most with a warm feeling by the time the credits start rolling. If parts are slightly embellished, there’s no shame considering the overarching message is a positive one. Most super fans of the book will probably have seen the film already, and to be honest you probably won’t miss much if you decide to skip it considering the lack of any major deviations in terms of plot. It’s filmed well enough, and it’s not like the story is hard to follow. Still, for newcomers like me, it was a welcome addition to the list of watchable British films - with the added bonus of no Danny Dyer. If you’re tired of period nonsense and London gangster films, (you shlag) you can’t go wrong with a bit of Bob.